-4 x 75mm Easy clean castors, - 2 x front castors to be braked, 2 x rear castors to be non braked. -Upper work surface – is manufactured from - White – 18MM LAMINATE MFC compact work top, this provides a very durable and easy to clean surface. 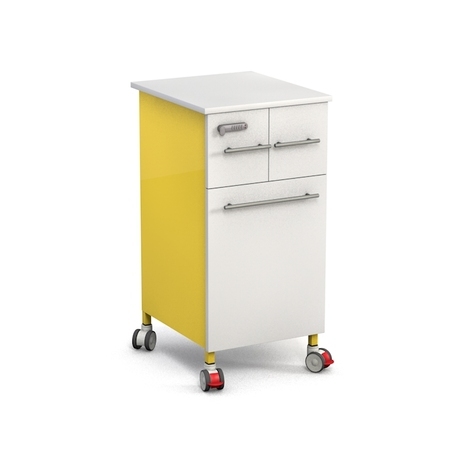 -Thumb operated fixing at the rear of the unit secures the work surface to the bedside locker which can be quickly removed for cleaning. Once the work surface is removed the side panels and rear panels simply lift off for cleaning. -Lift off removable all in one COLOUR CODED side & Rear panels, manufactured from mild steel and coated in durable Nylon modified polyester coating. – colour matched to the chosen colour of the locker. 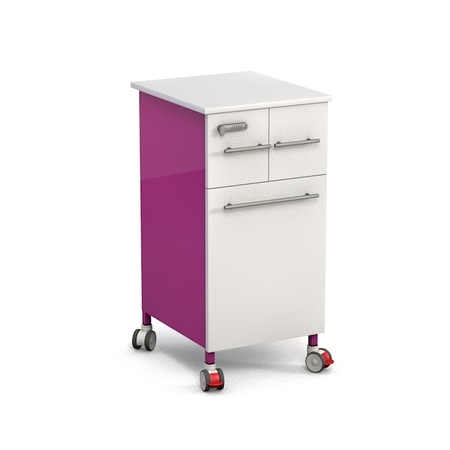 - 2 x Split Drawer unit positioned at the top of the bedside locker, complete with White 18MM MFC LAMINATE facia. 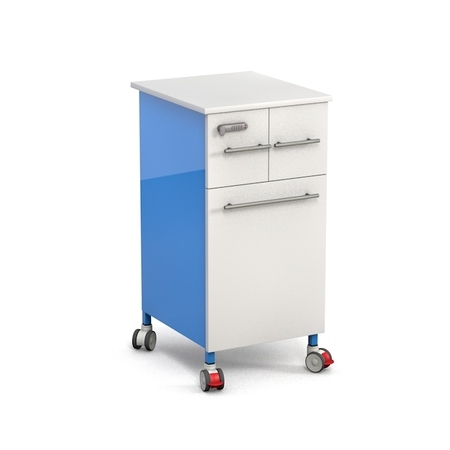 - 1 x LEFT HAND Drawer would lock on a digital “keyless” lock with a 4 to 8 digit programmable combination, each lock is also programmed with an override code should a combination be forgotten or lost, keeping the patients belongings secure but accessible at all times. - 1 x RIGHT HAND Drawer would be NON LOCKING. - 1 x 18MM MFC LAMINATE door to the lower storage area, complete with scalloped handle and hinged on the right hand side. - 1 x Removable bottom shelf coated in white nylon modified polyester. the shelf would have a retaining edge to the left , right and rear with the front edge faced down. - The shelf can easily be lifted out removed for cleaning. New Modular Design features of the New FW165 mean that EVERY panel of the unit can be removed if required; this means maintenance on these carts is very low cost. Should any part ever be damaged, the individual panel can be replaced, and to process does not require tools to do so, so the spare parts can simply be sent out for onsite fitment by the trusts own staff in seconds. 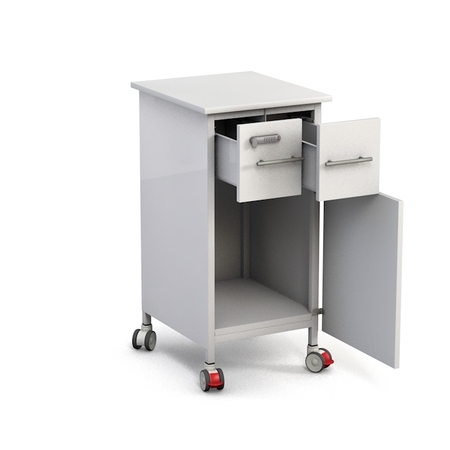 The overall lifecycle of this cart is incredible and will significantly reduce the lifecycle cost of the lockers. You have 0 x FW165-M in your quote.